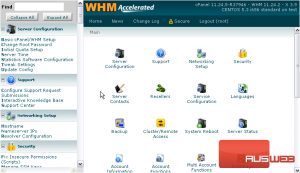 It’s important that you keep your customers informed of any maintenance or planned downtime. 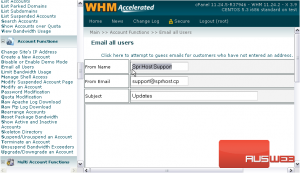 Assuming your clients keep their contact e-mails up-to-date in cPanel, you can send e-mail to all of them at once in WHM. 1) Go to the Account Functions. 2) Click Email all Users. 3) Fill in the form, starting with From Name. 5) Followed by the Subject to use for the e-mail. 6) And then the message body. 7) If you’d like to send this e-mail to your resellers’ customers, and not just your own, click this checkmark. It’s generally considered bad form to communicate with a reseller’s customers without permission, so try to avoid doing so, if possible. 8) When finished here, click Send. You will have the chance to confirm the message before sending it. That’s it! E-mails have been sent to all your direct customers, each of which should be listed above. This is the end of the tutorial. You now know how to e-mail all users in WHM.